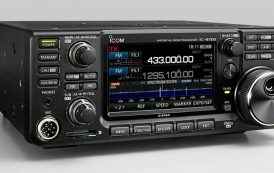 Dual Band & Dual Time Slot: VHF 136-174MHz, UHF 400-470 MHZ; GD-77 has both Tier I & II and is compatible with Motorola and other DMR radios. High Capacity Battery: Up to 18 hours working time as well as 48 hours standby time, which is 30% longer than MD-380. USB Port Charger: We replaced traditional charger to USB port which allows you to charge it with car charger adapter (12V). 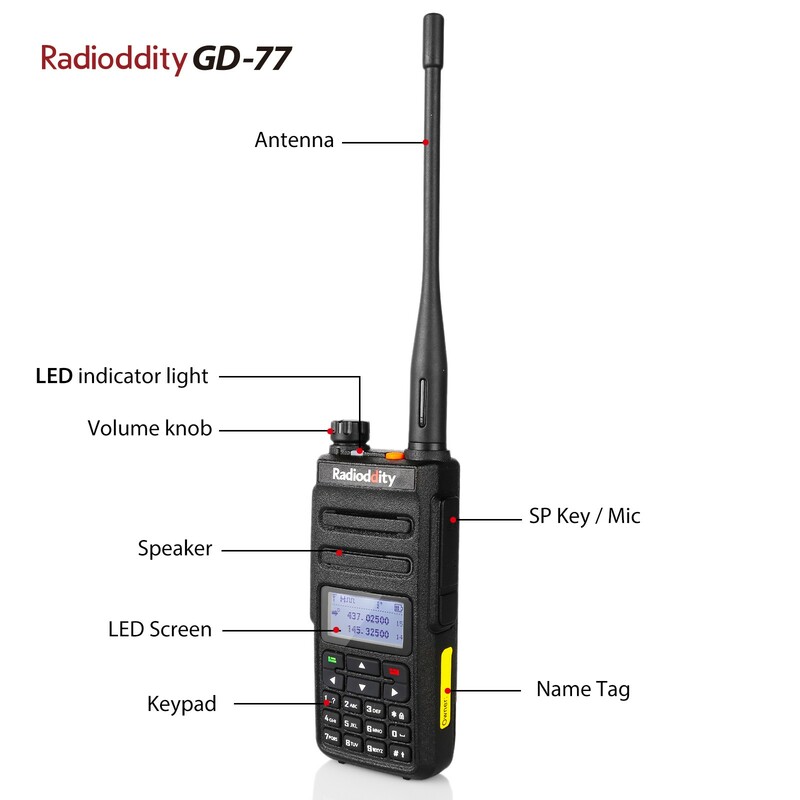 More operations available via keypad: Channel name, TX & RX frequency of a channel, display or hidden frequency, channel number etc., all these can be modified through the keypad.About GD-77:Radioddity GD-77 , as a DMR with Dual Band and Dual Time Slot, is ready to meet our customer’s various needs. Featuring 5 W High Power Output, Dual Band, Dual Time Slot, a 2200 mAh Battery, GD-77 is trying to come out as the most cost-effective DMR HT on the market, with both solid constructing in hardware and easy to use programming software. GD-77 enables you to keep in touch with others when mobile phones are not able to function. It is multifunctional — can be used in outdoor activities, school, construction sites, property management, business occasions, hotel, hospital, etc. 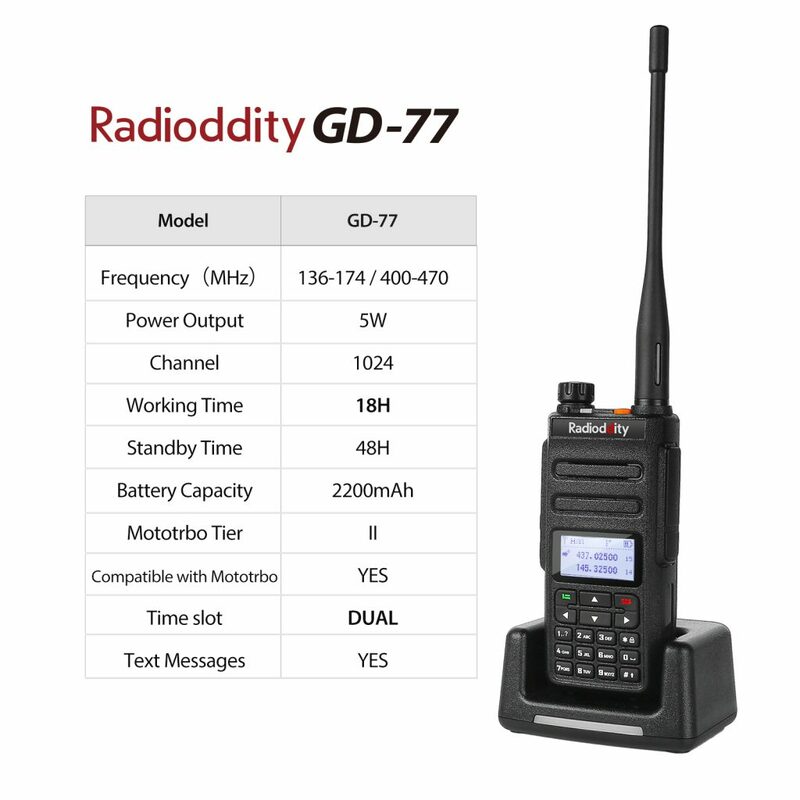 Radioddity GD-77 can deliver a quick response in any situation with crystal clear sound and you can use it when you need timely coordination or constant communication. 1. 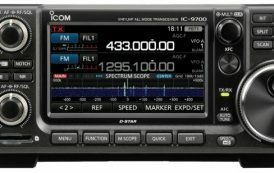 Software is available in a beginner mode and with an expert mode upon request designed for Amateurs/Hams (Password needed) with extended features. 2. Frequency/ID displayed on the screen: You can choose whether to display the frequency or ID on the screen via keypad setting. 3. Digital and Analogue Mode Convert: Please kindly note that Digital/Analogue Mode can only be turn ON/OFF via programming software. 4. Point to Point repeater function: You can use separate time slot in Group Calls. Under the PTT button there are two side keys on GD-77 . You can use programming software to customize them as hot keys based on your needs—Emergency On/Off, Scan On/Off, VOX On/Off, Repeater/Talk around, Zone select, etc (Up to 20 options). Once set, those features can be easily achieved when you press and hold or press and release the side keys. Although GD-77 is only 3CM in body thickness, the talking range can be as far as 5KM (3 Miles) under most circumstances. There are other factors that affect the range of a two-way radio too such as weather, exact frequency used, and obstructions. Please note that extended transmit time may lead excessive heat, affecting the battery lifespan.